The Land of Ooo reaches a satisfying climax that brings the original appeal of the show back into focus. From the start, “Adventure Time” was at war with its own potential. Creator Pendleton Ward transformed the format of an animated children’s show into a poetic rumination on childhood, merging geeky sensibilities with sophisticated imagery and a freewheeling mythology with no real parallel in popular culture. It was a transformative approach to all-ages entertainment, but it was also too good to last. In between its zany punchlines, the show had profound things to say about Cartoon Network’s core audience of drooling toddlers and hyperactive pre-teens — as well as the adult nostalgia for those halcyon days. But none of that fits in a marketing box, and as ratings dwindled, Ward left the show after Season 5. Showrunner Adam Muto kept the DNA intact, but “Adventure Time” faded into oblivion by the time it was officially canceled in early 2017. Since then, episodes have been released in short bursts, with tiny narrative arcs providing fleeting reminders of its singular presence in American storytelling. Now, the end is here, and it strikes a bittersweet note that feels just about right. The series finale of “Adventure Time,” a 45-minute assemblage of showdowns and confrontations designed to bring together every facet of its fantastical universe, salutes the best and worst of the “Adventure Time” journey. Ward’s original vision for the Land of Ooo, where adolescent human Finn (Jeremy Shada, who has literally grown up with the show) and pliable talking dog Jake (Joe DiMaggio) explore a post-apocalyptic land of candy princesses and magical critters, could be trippy, sophomoric, and poignant all at once, with a fantastical backdrop that made it less an homage than the genuine article. Earlier episodes in Season 10 concluded with a major cliffhanger, as Princess Bubblegum gathered her candy forces for a showdown over the future of the Candy Kingdom against her evil Uncle Gumbald, a cheery dictator (voiced with wonderful smarminess by Fred Melamed) keen on overtaking the Land of Ooo. That epic showdown does conclude, but first, the show opens with brilliant misdirection. Starting with its title sequence, it throws us into an entirely new setting, with characters we’ve never seen before. Rather than resorting to another silly confrontation, the show takes the long view, creating a framing device that brings closure to its underlying ideas rather than the busy plot. With time, it becomes clear that these fresh faces and circumstances speak to the notion that there can be beauty in any ending that leads to a new beginning. But we’re getting ahead of ourselves on that. First, thanks to a cheerful narration from adorable robot BMO (an unreliable narrator throughout the story), “Adventure Time” flashes back to the battlefield. It’s there that Finn and Jake (John DiMaggio) muster a last-ditch attempt to broke a peace deal between the warring relatives, which takes place in the confines of a collective nightmare. The princess and Gumbald exchange some words, while Fern — the plant version of Finn that sprouted off him and eventually rebelled — stands by Gumbald’s side as his henchman. A sudden magical maneuver by Jake sends the five of them careening into the unconscious plane, where these confrontations take on a goofy, abstract quality, like someone coloring in the lines of an M.C. Escher drawing. That’s when the episode really takes off. Characters shift forms and do battle across impossible landscapes, venturing deep into each other’s latent fears, as the show transforms its giddy plot into a dark, strange, and totally psychedelic plunge. It’s a vintage “Adventure Time” twist, loaded with visual inspiration and kooky tangents that wouldn’t seem out of place in David Lynch’s oeuvre. Among the more striking moments, the image of an evil tyrant crying — and then literally melting — into a birthday cake ranks as one of the best distillations of the show’s capacity to fuse so many categories of experience into one. Oh, yes: Princess Bubblegum and Marceline are a couple. The romance has been a wink-wink implication in the past, only explicitly acknowledged by show contributors outside of the episodes themselves, but “Adventure Time” finally wises up to confirm a courtship that should have been out in the open long ago. 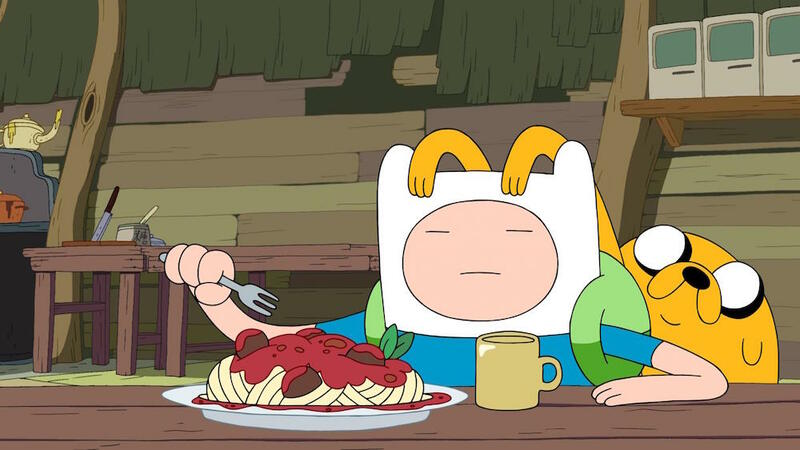 (Sexuality is probably quite fluid in the Land of Ooo, anyway.) Former “Adventure Time” writer Rebecca Sugar’s “Steven Universe” recently made history with a lesbian couple on its show, and it’s unfortunate that “Adventure Time” has to play catch-up with these characters so late in the game, but it nevertheless illustrates the extent to which the show has pushed beyond the conservative boundaries of mainstream entertainment. Theirs isn’t the only romantic tension on display. The Ice King’s sprawling history with Betty (Lena Dunham), the scientist-partner to researcher Simon who spent eons trying to rescue him from the hokey villain he became once he put on the crown, reaches an emotional climax. Some real deaths occur — not the first time for the show, but they’ve certainly never piled up at this rate — and they’re accompanied by genuine conversations about what it means to face mortality in the first place. The second half of “Come Along With Me” finds virtually every major character facing down a beastly creature that threatens the entirety of existence, and the battle concludes with an extraordinary black-and-white explosion straight out of Don Hertzfeldt. In the midst of the chaos comes one very scary development, and a beacon of hope in the form of a single call to arms: “My art is a weapon!” says one prominent character as the good guys strike back. It may as well be the show’s rallying cry. It didn’t always succeed, and couldn’t last forever, but at least it goes down swinging. Of course, that’s the point of “Adventure Time”: All good things come to an end, but memories ensure that it will always echo in the present. The powerful closing musical number “Time Adventure,” written by Sugar as a welcome parting gift, foregrounds the notion that “Adventure Time” derived its purpose from the joys of living in the moment no matter how terrifying or intangible the possibilities that lie ahead. “You and I will always be back then,” the cast sings, and anyone who has stuck with “Adventure Time” over the years can relate. The show’s writers often spoke of building out its universe as if toying around with “Dungeons and Dragons” figures, mining for endless imaginative pathways. The finale of “Adventure Time” is a welcome reminder that the game never really ends as long as the memories linger. 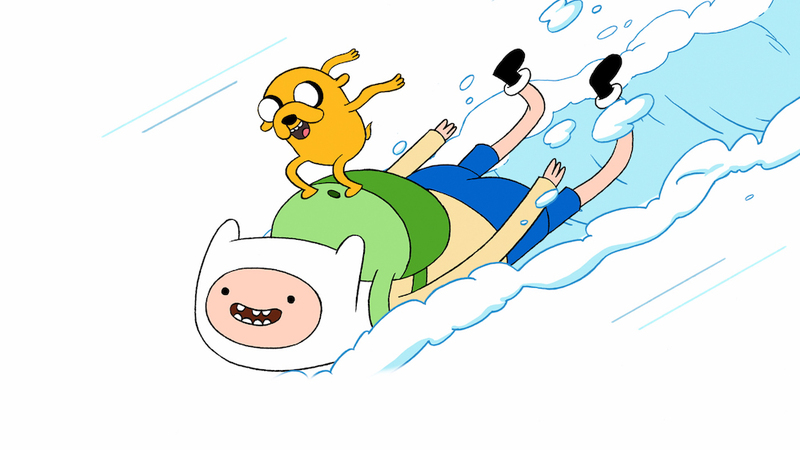 The series finale of “Adventure Time” airs on Cartoon Network on Monday, September 3. It will be available as part of the DVD package “Adventure Time: The Final Seasons” the following day.